The original potato foam gnocchi dish is a creation of molecular gastronomy chef Ferran Adria and El Bulli team. 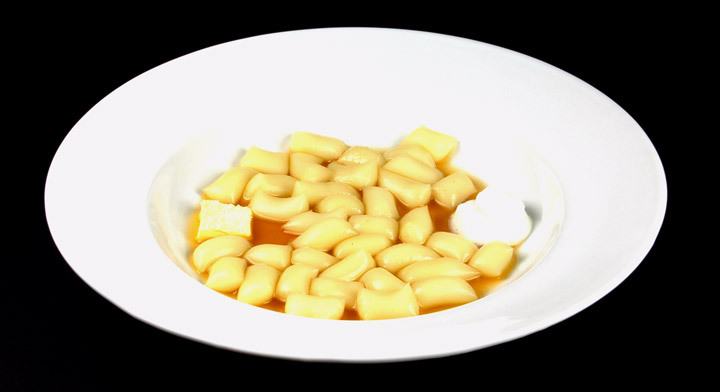 The gnocchi are made of a potato foam surrounded by a delicate membrane created using the Basic Spherification technique, also invented by Ferran Adria. The gnocchi are served with a consommé of roasted potato skin, whipped cream and sea water jelly butter ravioli (a square of butter wrapped in sea water jelly). I was not able to find the recipe anywhere but after a few tests I came up with a dish that I like. 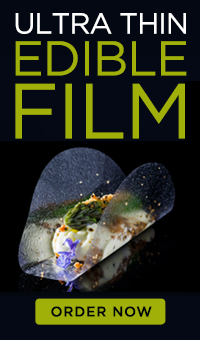 I never tried the original dish from El Bulli so I have no idea how far I am from it. I did not make the sea water jelly to wrap the butter square so I just served the gnocchi with a butter square sprinkled with sea salt flakes instead. Start by peeling the potatoes with a knife leaving skin with about 2 mm of potato. Put the thick potato skins on a pan in the oven with a little bit of oil so they don’t stick to the pan. Roast the potato skins until they have a dark color and some of the edges are almost burnt. Cut the potatoes in small 3 cm (~1 inch) squares and boil in 3 cups of water. Reserve the potato boiling water, the boiled potatoes and the roasted potato skins separately. Using an immersion blender, mix 300 g of potato boiling water with 5 g of sodium alginate. It takes a few minutes to mix it really well. Add 450 g of boiled potatoes and mix with the immersion blender until it is really smooth. Add the white truffle oil, salt, pepper and mix one more time. Pass the potato mix through a fine sieve and pour into a ½ L ISI Whip with the straight nozzle. Charge the ISI Whip with one cream charger and shake 3 times. Reserve. To make the consommé, put the roasted potato skins in a pot, cover with one cup of water (potato skins shouldn’t have too much room to float around) and bring to a boil. Remove the pot from the heat, cover with film and let it rest for 1 hour. Pass the resulting liquid through a superbag or sieve covered in cheesecloth. Reserve. Prepare the calcium bath by mixing the water with the calcium chloride. Get the sides ready so your gnocchi don’t get cold before serving. Cut the butter in 5 mm (1/5 inch) slices and then cut in squares of 2 cm sides (3/4 inch). Reserve in the fridge. Whip heavy cream and reserve in the fridge. You are now ready to create the potato foam gnocchi and serve. Keep reserved roasted potato skin consommé in a pot at about 60 ˚C (140 ˚F) so it is ready to heat the gnocchi right before serving. Get the ISI Whip with the potato foam and the calcium bath ready. Turn the ISI Whip upside down, immerse the straight nozzle in the calcium bath and carefully start injecting potato foam in the bath while you slowly move around the bath creating a serpentine shape. Then quickly proceed to cut the serpentine with a pair of scissors in pieces of 2 cm (3/4 inch) in length. Wait for 2 1/2 minutes moving the gnocchi occasionally so all sides get equally exposed to the calcium bath and remove gnocchi from the bath using a slotted spoon. Rinse them in warm water and place in the pot with the warm consommé. Wait for 3 to 5 min to get the gnocchi warm and you are ready to plate. The resulting gnocchi are a little thinner than what Ferran Adria serves at El Bulli. 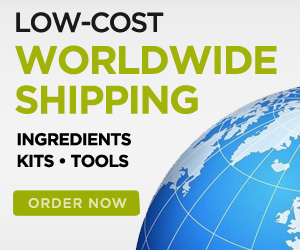 To make them thicker you can place a wider PVC or aluminum tube around the ISI nozzle. Remove gnocchi from potato skin consommé using slotted spoon and place on the plate leaving room for the butter squares and whipped cream. Put a square or two of butter on the plate and sprinkle sea salt flakes on them. Add a spoon of whipped cream on the side. 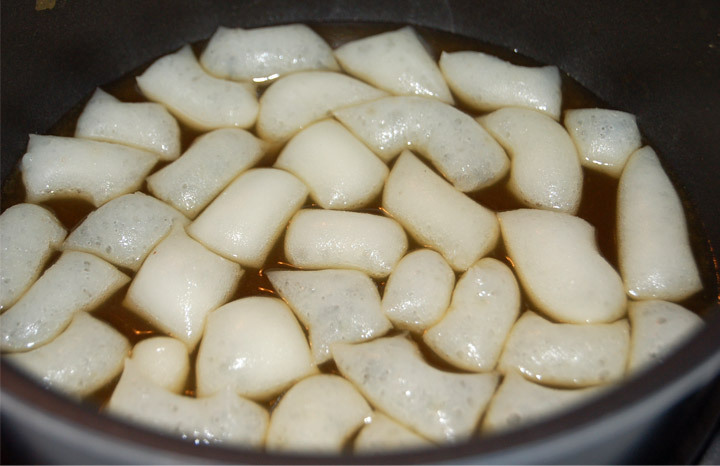 Carefully pour some roasted potato skin consommé on the gnocchi and serve immediately.